In 1308, Jean le Decer, Mayor of Dublin, erected a marble water cistern at his own expense, for the benefit of the citizens. This cistern was viewed with awe, as it’s like was never seen before in the city. Newgate Street was situated to the west of the cistern, this street was named after the new gate which formed a portal in the city wall. This area became popular for the sale of grain and subsequently Newgate Street became known as Cornmarket. The Bull Ring was to the north west of Cornmarket and was mentioned in writings, in the reign of Elizabeth 1st. Four times annually the youth of the city came here to receive training in martial combat. An officer was elected as Mayor of the Bull Ring, a post which he held for one year. Included in his duties for his year of authority was the punishment of those who frequented houses of ill – repute and brothels. He often accompanied the City Mayor and Sheriffs while they carried out their duties. Bread was always a very important part of the Irish diet. The Brehon Laws show that corn was cultivated in Ireland from the earliest times. During the Middle Ages, large quantities of grain were exported to England, Scotland and Wales. King John’s Charter enacted that foreign merchants should only buy corn, hides and wool from the citizens of the city of Dublin. Thus, Cornmarket would have been a very important and busy part of the city. In 1222, there was a complaint made against Henri de Loundres, Archbishop of Dublin, because he assumed a jurisdiction over the bakers. In 1310, there was a scarcity of corn and bakers, trying to make a greater profit, dishonestly sold false weights in bread. The annals record that the punishment for these dishonest bakers was to be dragged through the city on hurdles. During the Christmas season of 1332, a peck of wheat was worth twenty two shillings but the following year, as a result of temperate weather, the price in the Dublin Cornmarket fell to six pence per peck, forty four times less than the previous year. Keyzar’s Lane or De Keyzar’s Lane, as it was also known,extended from Cornmarket to Cook Street and was described in 1587 as “steep and slippery”. Jenico Marks, Mayor of Dublin in 1486, was slain in this lane in 1496, while attempting to quell a riot among the citizens. The Hall of the Guild of Carpenters, Millers and Tilers was situated at the west end of the lane and was known as New Hall. There was a meat market extending from Cornmarket to Cook Street and this was known as New Hall Market. A scaffold was erected at the New Hall and a Catholic priest, called Michael Fitzsimons, was hanged there in the sixteenth century, for being implicated in the insurrection of James Eustace, third Viscount Baltinglass. 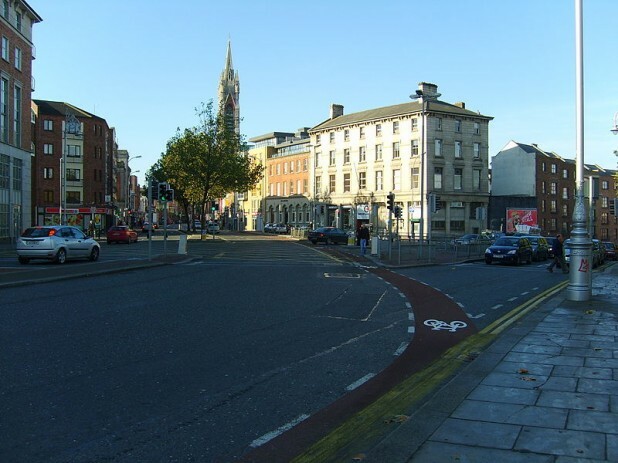 The Cornmarket of Dublin was moved to Thomas Street early in the eighteenth century. It was difficult to pass through the area because of the activities of people known as “Pluckers in”. As the name suggests, their job was to stand in the streets, trying to entice customers into the shops. During the latter part of the eighteenth century the role of the Cornmarket was gone and the area was chiefly inhabited by haberdashers, woollen drapers and dealers in linens. Stay tuned as we travel back and look at more parts of Olden Dublin! Happy St Patrick’s Day Look at these Great Pics! Very nice, informative but of history over quite a span! Thanks for posting it. I’m from clontarf originally, living in the states a long time. We used to shop at frawleys and was it the dublin bazaar? And was there a ‘western grill’ on Thomas St too? Thanks again, missing the big smoke!